FURTHER RYANAIR STRIKE action can’t be ruled out as of yet, according to the union representing pilots who are in a dispute with the airline. Ryanair and the Irish Air Line Pilots’ Association, which is part of trade union Fórsa, are meeting today in an attempt to reach a resolution to the long-running Irish dispute. The talks are being mediated by Kieran Mulvey, the former head of the Workplace Relations Committee. In a statement from the union this afternoon, it said the talks are currently underway at Dublin Airport. Mulvey told the parties this afternoon that he’s set aside three days for the talks. He also asked both parties to refrain from public and media comment while the process is underway. The dispute among Irish pilots centres around working conditions and how Ryanair organises transfers of its pilots between bases. There has been much back-and-forth between the airline and trade union in recent weeks. 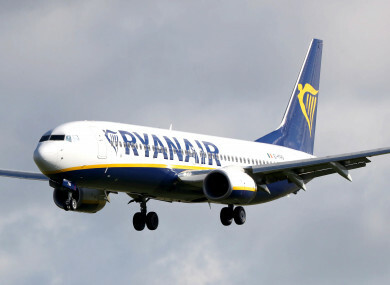 On Friday, Irish pilots, along with their Ryanair colleagues in Germany, the Netherlands, Sweden and Belgium, refused to perform their duties in another day of strike action, meaning that over 1,000 flights did not take place across Europe. Speaking on RTÉ’s Morning Ireland this morning, Bernard Harbor, representing Fórsa, said the union has agreed to enter talks “without preconditions”. He said the union has not served notice of further strike action while the process of mediation is underway. However, he added that he “can’t rule out further disruption” . Ryanair’s Kenny Jacobs said the airline does not want to see further strike action take place, adding that it does not want any further disruption for customers. “Strikes will not move this dispute forward… strikes are damaging,” said Jacobs, who added he believed a resolution was achievable. Jacobs said the airline has collective labour agreements in other places and it is their hope to have one in Ireland. The union representative said the issue of Ryanair’s chief executive, Michael O’Leary, threatening to move jobs to Poland will be raised at today’s meeting. If some market is being damaged, as the Irish market has been damaged in recent months by these activities, the Polish market is growing hugely strongly for us. The Ryanair Sun is very full, profitable. We need more aircraft in the Polish market – move aircraft to Poland. When asked about the threat to Ryanair workers, Jacobs said the further strike action will only weaken the Irish market position. He said the decision to move pilots “is unrelated”. “It is a commercial decision… that is unrelated,” he said, adding that the airline will continue to move aircraft form any weakened market. Speaking about the possibility of jobs being moved from Ireland, Harbour said, “I have to say from pilot’s perspective, it is too much of a coincidence it happened to be announced in the middle of this dispute”. He added that O’Leary’s threat was seen as an “escalation” in the dispute last week which added an “unnecessary complication” to the talks process. “I would be amazed if that didn’t come up in the process today,” he said. The meeting between Ryanair management and union representatives gets underway this morning. Email “'We can't rule out further strikes': Ryanair and union reps meeting today in a bid to avoid further travel chaos”. Feedback on “'We can't rule out further strikes': Ryanair and union reps meeting today in a bid to avoid further travel chaos”.